37 فأخذ يعقوب لنفسه قضبانا خضرا من لبنى ولوز ودلب وقشر فيها خطوطا بيضا كاشطا عن البياض الذي على القضبان . 38 واوقف القضبان التي قشرها في الاجران في مساقي الماء حيث كانت الغنم تجيء لتشرب . تجاه الغنم . لتتوحم عند مجيئها لتشرب . 39 فتوحّمت الغنم عند القضبان وولدت الغنم مخطّطات ورقطا وبلقا . والمقصود بالوحم الغثيان والقيء المتكرر الذي يصيب الحامل . ومع أن الوحم تشتد أعراضه في ساعات الصباح الأولى إلا أنه قد يحدث في أي وقت من ساعات اليوم . (SVD) فَتَوَحَّمَتِ الْغَنَمُ عِنْدَ الْقُضْبَانِ وَوَلَدَتِ الْغَنَمُ مُخَطَّطَاتٍ وَرُقْطا وَبُلْقا. وَحِمَت المرأَة تَوْحَم وَحَماً إِذا اشتَهت شيئاً على حَبَلِها، وهي تَحِمُ، والاسم الوِحامُ والوَحام، وليس الوِحامُ إِلا في شَهْوة الحَبَل خاصَّة. (ASV) And the flocks conceived before the rods, and the flocks brought forth ringstreaked, speckled, and spotted. (BBE) And because of this, the flock gave birth to young which were marked with bands of colour. (Bishops) And the sheepe conceaued before the roddes, & brought foorth lambes ryngstraked, spotted, and partie. (CEV) in front of the branches, and their young were spotted and speckled. (Darby) And the flock was ardent before the rods; and the flock brought forth ringstraked, speckled, and spotted. (DRB) And it came to pass, that in the very heat of coition, the sheep beheld the rods, and brought forth spotted, and of divers colours, and speckled. (ESV) the flocks bred in front of the sticks and so the flocks brought forth striped, speckled, and spotted. (Geneva) And the sheepe were in heate before the rods, and afterward brought forth yong of partie colour, and with small and great spots. (GNB) So when the goats bred in front of the branches, they produced young that were streaked, speckled, and spotted. (GW) they mated in front of the branches. Then they gave birth to young that were striped, speckled, or spotted. (JPS) And the flocks conceived at the sight of the rods, and the flocks brought forth streaked, speckled, and spotted. (KJV) And the flocks conceived before the rods, and brought forth cattle ringstraked, speckled, and spotted. (LITV) And the flocks were in heat before the rods and bore striped, speckled and spotted offspring. (MKJV) And the flocks conceived before the rods, and brought forth striped cattle, speckled, and spotted. (RV) And the flocks conceived before the rods, and the flocks brought forth ringstraked, speckled, and spotted. (Webster) And the flocks conceived before the rods, and brought forth cattle ring-streaked, speckled, and spotted. (YLT) and the flocks conceive at the rods, and the flock beareth ring-streaked, speckled, and spotted ones. (LXX) ἐγκισσήσωσιν τὰ πρόβατα εἰς τὰς ῥάβδους· καὶ ἔτικτον τὰ πρόβατα διάλευκα καὶ ποικίλα καὶ σποδοειδῆ ῥαντά. 30:39 So the cattle conceived at the rods, and the cattle brought forth [young] speckled, and streaked and spotted with ash-coloured [spots]. לט וַיֶּחֱמוּ הַצֹּאן,אֶל-הַמַּקְלוֹת; וַתֵּלַדְןָ הַצֹּאן,עֲקֻדִּים נְקֻדִּים וּטְלֻאִים. 39 And the flocks conceived at the sight of the rods, and the flocks brought forth streaked, speckled, and spotted. A primitive root; Probably to be hot; figuratively to conceive: - get heat, be hot, conceive, be warm. In sheep, whiteness is not albinism but a dominant gene that actively switches color production off. 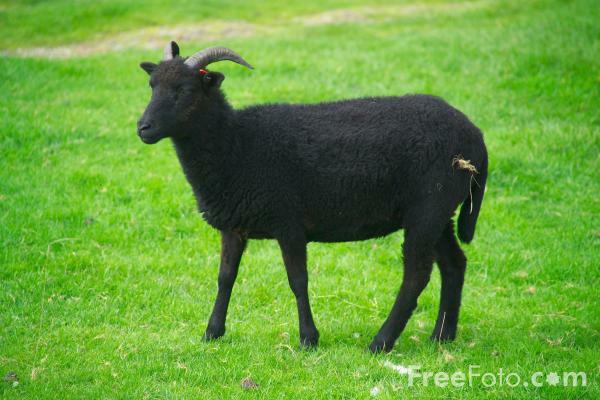 As a result, sheep blackness is recessive, and if a white ram and a white ewe are parents of a black lamb, both must be heterozygous for black, and then there is a 25% chance that the lamb will be black. A recent study done by the Agricultural University of Norway, and the Vollum Institute of the Oregon Health Sciences University believe the black color is created by an allele E D at the extension locus. Red and tan goats are genetically white. They may have some “shadow markings” of somewhat darker color on face, shoulders and legs. It is possible that homozygotes (goats possessing two copies of the A wt gene) are white, heterozygotes (goats possessing one copy only of the A wt gene) are red or tan. I am waiting for clarification on this color from Phil Sponenberg. It appears to be a darker tan overlay over lighter tan or white, with light facial striping and dark stripes on the legs. This is similar to sable, with the addition of dark head markings, martingale, and partial dorsal stripe. Tan with black on head, brisket and down spine, pale stripes on head. Like bezoar but with dark belly and legs. Common pattern in pygmy goats. Tan with black belly, backstripe, lower legs and face. Similar to badgerface, but with more black on chest, legs, and head, leaving only the sides tan. Black front half, tan rear half, light stripes on dark head, pale legs. In the Nigerian, can be very variable in how far back the black extends, but the black chevron on the rear legs is distinctive. Very similar to buckskin, but lacks the facial markings. The dark color on the cape and rear legs is more extensive. The goat is uniformly covered with a mix of white and black hairs, producing a grey effect. Like grey, with the addition of a darker martingale. The most common pattern in pygmy goats, grey with a dark martingale and dorsal stripe and dark legs. Tan front half, black rear half, dark legs, pale head with dark stripes. Cou clair has a tan front, cou blanc has a white front. Two-tone chamoisees have dark areas that are any color other than black. Intermediate between Swiss markings and light belly. This pattern has facial striping like the Swiss marked pattern, plus the light belly of the light belly pattern. There are dark markings on the front of the legs, but they are not the more complicated striping of the light belly pattern. Dark with light belly, striped legs, light inside ears and facial stripes. Sundgau has white markings instead of tan. Similar to the markings of a Doberman pinscher. Like light belly but with a dark belly, dark nose and light facial stripes. The leg striping is less extensive than in similar patterns. Some Alpine breeders call the dark-bellied animals sundgaus. Black and tan hairs intermixed. Black legs and face. Similar to the bay pattern in horses. Black with tan patches on cheeks. Produces chocolate-brown pigment in areas that would otherwise be black. Responsible for albinism (very rare in the goat) and some light-colored pigmentation. May be responsible for a color dilution similar to cremello in the horse, but not proven in goats. Dilutes black pigment to blue or grey and tan to cream. Effects in the goat not documented. In most mammals, alleles at the Extension locus cause black coat areas to become yellow or red. May be responsible for “extension red” or “recessive red"
Before continuing, it's important to note that there are actually two very important components of the overall color of a goat. The first is the color pattern produced by the Agouti locus, discussed below, possibly modified by B, E or other modifier genes as discussed below. These color patterns include solid red, black, chocolate and tan, plus the familiar patterns such as buckskin and chamoisee. The second factor is spotting and other color modifications such as moon spots and roaning that cover the original Agouti locus pattern. Genetically, an animal that is buckskin with so much white spotting that it's difficult to determine the animal's pattern is every bit as much a buckskin as the animal with no white spotting at all. Spotting can be thought of as "paint" that covers the Agouti locus patterns. Because of this, it's important to keep in mind that there are actually two ways to produce a goat that appears to be white. The first is goats that are genetically white, as discussed under the Agouti locus. These goats are often, especially when their hair grows out, noted to be a very light cream. The second way of producing a white goat is an animal that is so extensively spotted as to appear entirely white. It must be remembered that if an animal that appears all-white has only a few spots of color, that animal is not genetically white, but instead has an Agouti locus pattern other than white, masked by all the spotting. Even genetically white goats can be spotted! كان يعقوب يعمل بمثابة أجير عند حميه لابان ، واقترح أن يأخذ أجرته كل الغنم والمعز المرقط من بين ما تلده الغنم لكن لابان أخذ كل الذكور والإناث المخططة ولم يترك ليعقوب سوى التي لها لون واحد ، ولما كان يعقوب كغيره من الناس له خلفية ثقافية خاطئة ، أراد أن يؤثر على الغنم بوضع قضبان مرقطة أمامها حتى تتوحم عندها وبالتالي تلد له غنما مرقطة ، لكن هذا التصرف لا محل له من الصواب علميا ، لأنه لا تأثير لما تراه العين على الصفات الوراثية . إنها حقيقة رائعة ومدهشة عندما نرى الله يصحح فكرة خاطئة لأحد رجاله ودون أن يوضح له السبب إنما لم يتركه في ضلاله ، لقد جعل الله له فحولا مرقطة تصعد على الإناث لتلد له غنما مرقطة ، ولم يكن للقضبان أدنى تأثير على هذه الصفات الوراثية لعلمه تعالى بأن الوراثة حتى للألوان هي من الأب والأم وليس من أي تأثير خارجي .
" 25 وحدث لما ولدت راحيل يوسف ان يعقوب قال للابان اصرفني لاذهب الى مكاني والى ارضي 26 اعطني نسائي واولادي الذين خدمتك بهم فاذهب لانك انت تعلم خدمتي التي خدمتك 27 فقال له لابان ليتني اجد نعمة في عينيك قد تفاءلت فباركني الرب بسببك 28 وقال عين لي اجرتك فاعطيك 29 فقال له انت تعلم ماذا خدمتك وماذا صارت مواشيك معي 30 لان ما كان لك قبلي قليل فقد اتسع الى كثير وباركك الرب في اثري والان متى اعمل انا ايضا لبيتي 31فقال ماذا اعطيك فقال يعقوب لا تعطيني شيئا ان صنعت لي هذا الامر اعود ارعى غنمك واحفظها 32 اجتاز بين غنمك كلها اليوم واعزل انت منها كل شاة رقطاء وبلقاء وكل شاة سوداء بين الخرفان وبلقاء ورقطاء بين المعزى فيكون مثل ذلك اجرتي 33 ويشهد في بري يوم غد اذا جئت من اجل اجرتي قدامك كل ما ليس ارقط او ابلق بين المعزى واسود بين الخرفان فهو مسروق عندي 34 فقال لابان هوذا ليكن بحسب كلامك "
يعقوب صار بركة لبيت لابان وان لابان أحس بهذا فكان يود لو بقي يعقوب معه حتي تستمر البركة. ثم نجد أن يعقوب ولابان يتفقان علي طريقة يأخذ بها يعقوب اجرته. البلقاء: السواد والبياض موزعان علي السواء. الرقطاء: سوداء يشوبها نقط بيضاء. وهذه الصفات للغنم (سواء من الخرفان أو الماعز) قليلة ونادرة والأغلب هو الأبيض والأسود. والقسم الثاني يأخذه لابان معه ويبتعد مسيرة 3 أيام عن يعقوب، لمدة معينة من الزمن. قبل لابان عرض يعقوب لأنه افترض أن القطيع الأبيض والأسود سيكون نتاجه غالباً أبيض وأسود وأن البلقاء والرقطاء فيه أي نصيب يعقوب المتفق عليه سيكون هو القليل. ولابان قبل العرض نتيجة جشعه وطمعه ظانا بهذا أنه سيخرج بنصيب الأسد. ولكن الله خيب ظن لابان وكان النصيب الأكبر ليعقوب فجاءت الغالبية بلقاء ورقطاء ونفهم من (10:31) أن الله هو الذي أوحي ليعقوب بهذه الفكرة أي أن تكون أجرته هي البلقاء والرقطاء. فالله كان ناوياً أن يعوضه عن أمانته وخدمته لخاله بأمانه كل هذا العمر والله كان يعرف جشع خاله وأنه سيخدعه مراراً فأرشده الله لهذه الخطة. ولكن نجد يعقوب مرة اخري يسقط في الحلول البشرية والخداع والمكر. فنجده يقشر أعواد بعض النباتات حتي تبدو منقطة ويضعها أمام الغنم التي ستلد حينما يجد الغنم قوية. وهو إعتمد علي فكرة الوحم عند الإناث اللواتي يلدن.فحينما تتوحم الشاة التي ستلد وأمامها ألوان منقطة تكون الشاة المولودة منقطة. وهذه الفكرة موجودة حتي الأن ولكنها لم تثبت علمياً. فنجد أن كثرة الغنم المنقطة القوية التي صارت ليعقوب كانت نتيجة بركة الرب وليس لخداعات يعقوب. هي عدم إيمان وثقة في وعود الله الذي قال له أنه يبارك. وهذا حدث مرتين في حياة يعقوب. فالله وعد رفقة بأن كبير يستعبد لصغير. والله وعده بأنه سيبارك وفي المرة الأولي خدع أبوه إسحق ليضمن البركة والمرة الثانية خدع خاله لابان ليضمن بركة لنصيبه. وكان الله سيعطيه البركة في المرتين دون خداع! وما نتيجة الخداع؟ انه خدع مرتين الأولي في موضوع ليئة والثانية في موضوع يوسف!! " كما فعلت يفعل بك (عو 15)".
" 30 لان ما كان لك قبلي قليل فقد اتسع الى كثير وباركك الرب في اثري والان متى اعمل انا ايضا لبيتي "
لقد زاد قطيع لابان من قطيع صغير تقوده راحيل إلي قطعان يفصل بينهما مسيرة 3 أيام أي حوالي 65 كيلو متر. وهذه المسافة دليل ضخامة قطعان لابان.
" 32 اجتاز بين غنمك كلها اليوم واعزل انت منها كل شاة رقطاء وبلقاء وكل شاة سوداء بين الخرفان وبلقاء ورقطاء بين المعزى فيكون مثل ذلك اجرتي "
أجتاز بين غنمك … وأعزل أنت: أي الأثنين يمران سوياً لكن لابان هو الذي يعزل ويختار ويشرف علي عملية الفصل ليضمن حقه. فيكون مثل ذلك أجرتي: أي بعد عزل كل ما هو بلقاء ورقطاء يبقي ما هو أبيض وما هو أسود.وناتج هذا القطيع الأبيض والأسود كل ما يوجد فيه من بلق ورقط مثل الذي عزله لابان يكون من نصيب يعقوب.
" 33 ويشهد في بري يوم غد اذا جئت من اجل اجرتي قدامك كل ما ليس ارقط او ابلق بين المعزى واسود بين الخرفان فهو مسروق عندي "
يشهد في بري: صيغة قسم والمعني ان بره وشرفه يشهدان له أو عليه أن حاول أن يغير أجرته التي عينها لنفسه. فهو مسروق عندي: كل ما ليس له هذه الصفات يكون مختلساً منك.
" 34 فقال لابان هوذا ليكن بحسب كلامك "
هوذا ليكن بحسب كلامك: لابان وافق ظانا أنه الفائز في هذه الصفقة فالمنقط نادر.
" 37 فاخذ يعقوب لنفسه قضبانا خضرا من لبنى ولوز ودلب وقشر فيها خطوطا بيضا كاشطا عن البياض الذي على القضبان "
اللبني: نبات له لبن كالعسل يسمي الميعة. والدلب: نبات يوجد في السهول وعلي شواطيء الأنهار. ويعقوب وضع هذه الأعواد بعد أن قشرها في المساقي أمام الغنم حين كانت تأتي لتشرب. والله وعده بالبركة حين أرشده لإختيار المنقطة ولكنه لم يرشده لهذه الخدعة.
" 41 وحدث كلما توحمت الغنم القوية ان يعقوب وضع القضبان امام عيون الغنم في الاجران لتتوحم بين القضبان "
نلاحظ أن يعقوب كان يصنع هذا مع الغنم القوية ليكون نصيبه قوياً ولا يصنع هذا مع الضعيفة فتكون البيضاء نصيب لابان هي الضعيفة.
" 43 فاتسع الرجل كثيرا جدا وكان له غنم كثير وجوار وعبيد وجمال وحمير "
إتسع الرجل كثيراً جداً: ليس بسبب الخدعة ولكن لأن الله يريد ان يباركه. وَأَنْتَ يَا اَللهُ تُحَدِّرُهُمْ إِلَى جُبِّ الْهَلاَكِ. رِجَالُ الدِّمَاءِ وَالْغِشِّ لاَ يَنْصُفُونَ أَيَّامَهُمْ. أَمَّا أَنَا فَأَتَّكِلُ عَلَيْكَ.